The Parliament of the United Kingdom of Great Britain and Northern Ireland is the highest legislative body in the United Kingdom and British overseas territories. It alone has parliamentary sovereignty over all other political bodies. At its head is the Sovereign, Queen Elizabeth II. The parliament has an upper house, the House of Lords, and a lower house, the House of Commons. The Queen is the third part of Parliament. Parliament developed from the early medieval councils of bishops and earls that advised the sovereigns of England. The Parliament of the United Kingdom is split into three separate parts, the House of Commons (the lower house), the lords (the upper house) and the Monarch. Most legislative power is concentrated in the House of Commons. It is made up of 650 Members of Parliament (MPs). These people are elected by the people of the United Kingdom to represent them in the House of Commons. The leader of the political party who commands a majority of MPs is usually made the Prime Minister, but not the Head of State, a position reserved for the Sovereign. The House of Commons starts most Bills, the remainder originating in the House of Lords, and decides rates of taxation as a result of election by the other hereditary peers and two other hereditary peers who have ceremonial jobs in the House of Lords. They are the Earl Marshal who is always the Duke of Norfolk and the Lord Great Chamberlain, the Marquess of Cholmondeley. The House of Lords has the power to reject Bills, except Money Bills (tax bills), and make the House of Commons reconsider them. If the House of Lords vetoes a bill twice or delays a public Bill for more than one year then the House of Commons can force the Bill through under the terms of the Parliament Acts, unless it originated in the House of Lords. The monarch (now HM Queen Elizabeth II) is the sovereign in a constitutional monarchy and, theoretically, is the fount of all power in the United Kingdom. Bills must receive the Royal Assent before becoming Acts of Parliament and the monarch is responsible for summoning, proroguing and dissolving Parliament, normally upon the advice of the incumbent Prime Minister. It is now very rare for a monarch to object, but the sovereign still retains this prerogative for use if necessary. Pre-legislative Scrutiny: Joint committee of both houses review bill and vote on amendments that government can accept or reject. Reports are influential in later stages as rejected committee recommendations are revived to be voted on. Third Reading: A debate on final text as amended. In the Lords, further amendments may be tabled at this stage. Pre-legislative Scrutiny: To consider all amendments. The bill is then processed for Royal Assent, if accepted, the bill becomes an Act. In the Middle Ages and early modern period there were three kingdoms within the British Isles — England, Scotland and Ireland — and these developed separate parliaments. The 1707 Acts of Union brought England and Scotland together under the Parliament of Great Britain, and the 1800 Act of Union included Ireland under the Parliament of the United Kingdom. The parliament at Westminster in London is sometimes called the "Mother of all Parliaments"
The English Parliament has its origins in the Anglo-Saxon Witenagemot. In 1066, William of Normandy brought a feudal system, where he sought the advice of a council before making laws. In 1215, this council got the Magna Carta from King John, which established that the king may not levy or collect any taxes (except the feudal taxes to which they were hitherto accustomed), save with the consent of his royal council, which slowly developed into a parliament. In 1265, Simon de Montfort, 6th Earl of Leicester called the first elected Parliament. The Laws in Wales Acts of 1535–42 annexed Wales as a part of England and brought Welsh representatives to Parliament. When Elizabeth I was succeeded in 1603 by the Scottish King James VI of Scotland (James I of England) the countries both came under his rule, but each kept its own Parliament. In Scotland in the High Middle Ages the King's Council of Bishops and Earls was the beginning of the Parliament of 1235. 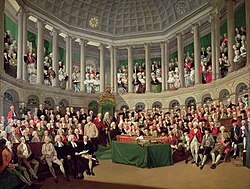 The Irish Parliament was founded to represent the English community in the Lordship of Ireland, but the native or Gaelic Irish were not allowed to vote or stand for office, the first known meeting being in 1264. In 1541 Henry VIII declared the Kingdom of Ireland. The Gaelic Irish lords were now entitled to attend the Irish Parliament as equals of the majority of English descent. ↑ Jones, Clyve. (2012). A short history of Parliament: England, Great Britain, the United Kingdom, Ireland and Scotland, p1; excerpt, "It is a commonly held misconception that the Westminster parliament is the 'mother of all parliaments' ... but the original phrase in 1865 was 'England is the mother of all parliaments'"
Blackstone, Sir William 1765. Commentaries on the Laws of England. Oxford: Clarendon Press. Davies M. 2003. Companion to the Standing Orders and guide to the proceedings of the House of Lords, 19th ed. Farnborough, Thomas Erskine, 1st Baron 1896. Constitutional history of England since the Accession of George the Third, 11th ed. London: Longmans, Green and Co. This page was last changed on 5 September 2017, at 00:25.